Red arrows are shell casings. 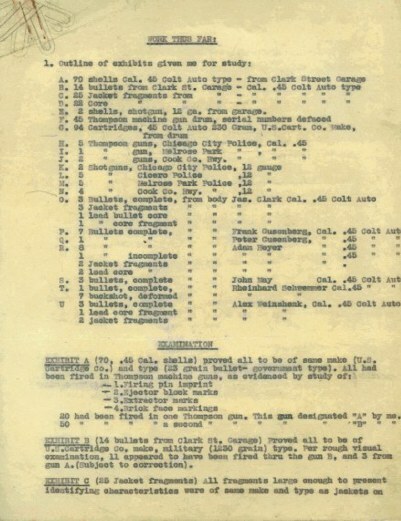 Yellow arrows are bullets and schrapnel (pieces). White arrow is an unfinished cigarette. Complete list of all bullet and bullet fragments picked up at SVD crime scene. 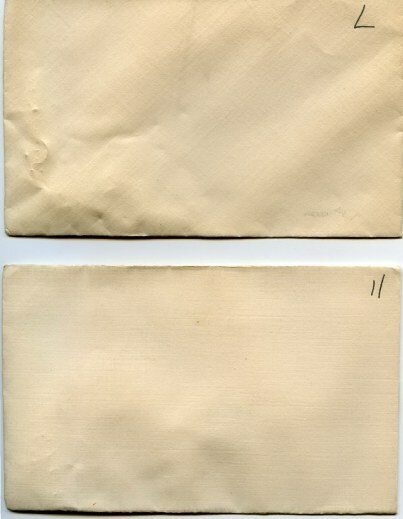 These two fragments are from the noted Exhibit C and D.
Fragment envelopes X-rayed before opening. 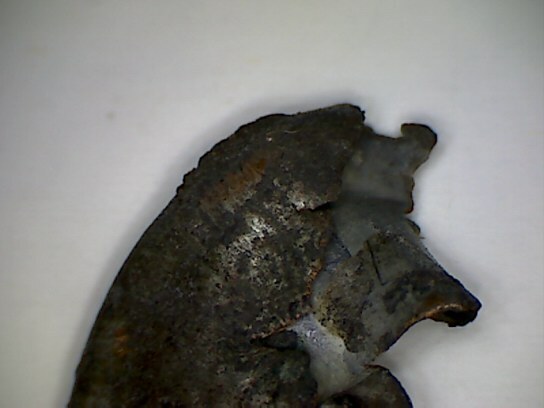 This bullet jacket fragment shows the marks from the rifling of the Thompson barrel. Did it unravel upon hitting bone or wall? Anyone's guess. 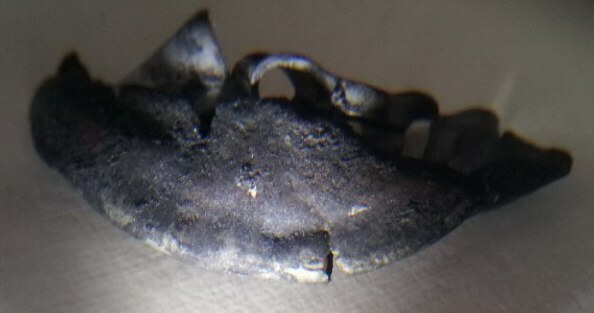 Close up of bullet jacket. 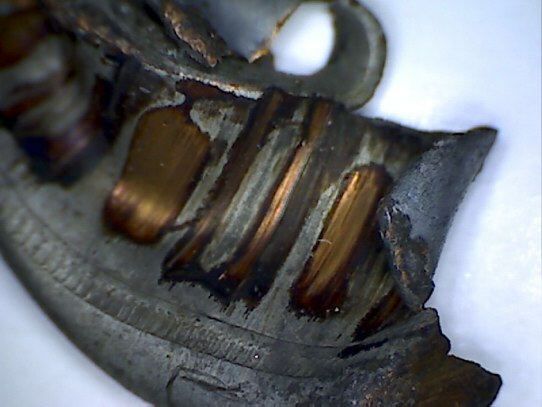 Note the U.S. Cartridge co. cannelure under the distinct Thompson machinegun rifling marks (copper marks). Jacket slug turned over. 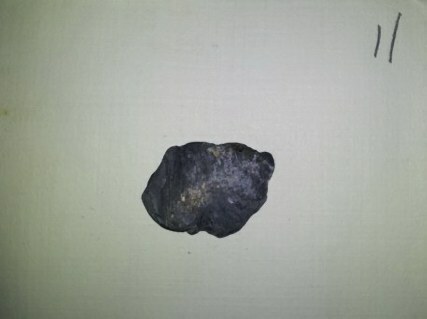 Note half "S" beside crack in jacket. 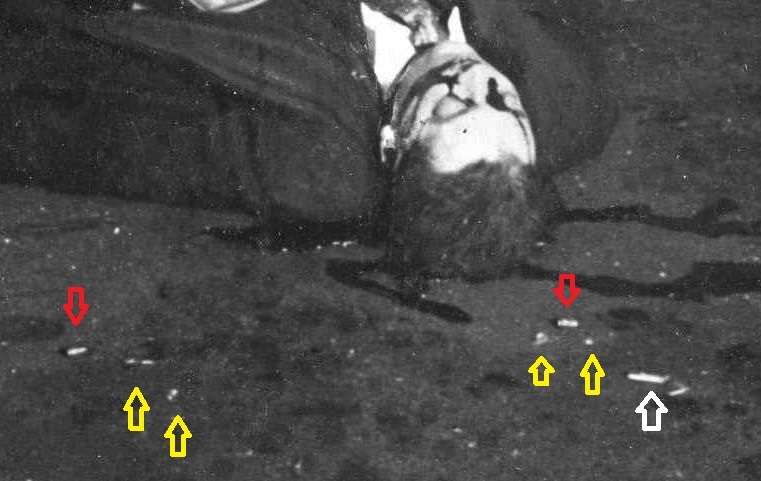 The bullet impacted in this area thus obliterating the partial "S" marking above the cannelure. 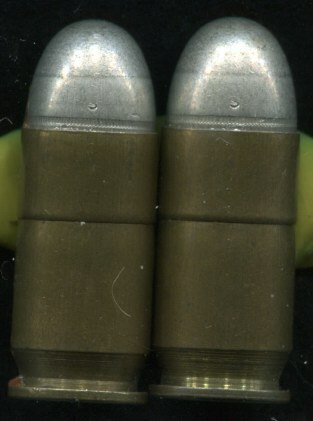 U.S. Cartridge Co. limited "S" stamped rounds with cannelures. 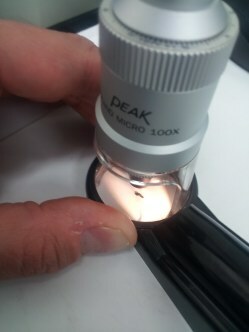 These ones shown here were found in Fred Burke's home. 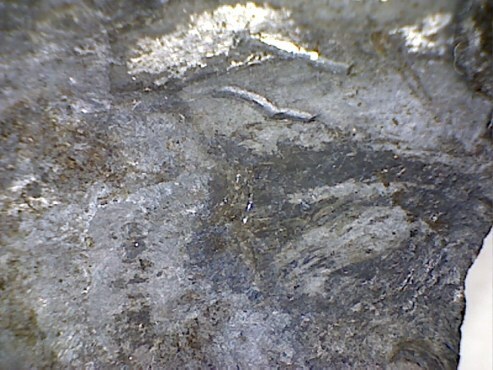 Close up of S rounds. These are the same ones used in the St. Valentine's Day Massacre. 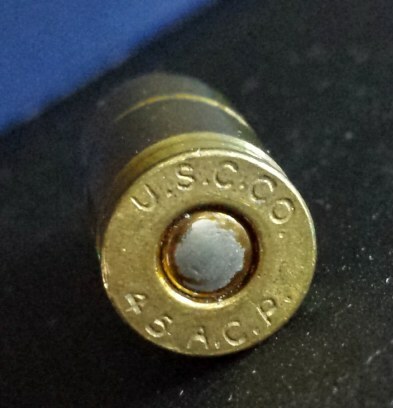 Close up shows partial "S" stamp on jacket from limited U.S. Cartridge co. .45 caliber round used in massacre. Much speculation has been made over the years about the what the "S" signifies. Many claim it meant smokeless or staynless. Neither one makes any sense because smokeless was invented at the turn of the century. 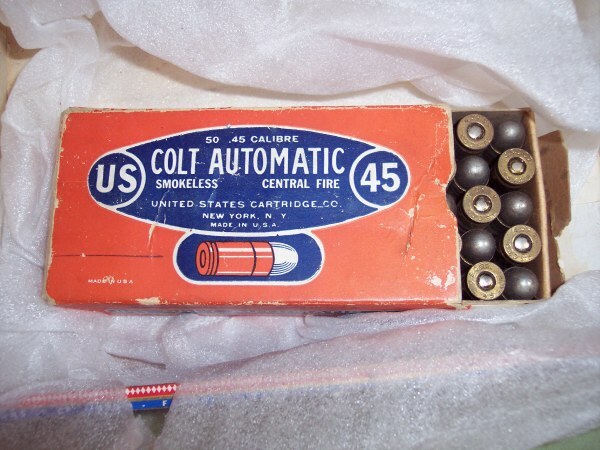 There was no need to make a special stamp on rounds when smokeless rounds were by now the norm and it was already printed on the ammo boxes. Staynless was a particular branding by Winchester for Winchester ammo and was not associated with U.S. Cartridge Co. ammo, even though the company that owned Winchester by this time owned U.S. Cartridge Co.
Staynless is also not feasible because the were many other different rounds made by U.S. Cartridge Co. that had the S stamp and were made of copper and other metals. An S die could have just been chosen at random to do the year long control sample run or it could have meant just that, Sample? How about S for Sporting ammo? (Non military). 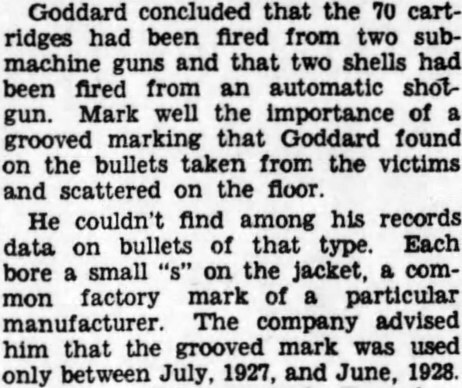 All good theories, but from all the evidence I have looked at and from Goddard's own mouth is the simple answer that the S stamped on these bullets were merely a manufacturer's identifying mark chosen in representing the U.S. Cartridge Co.
By the end of 1926, much of the U.S. Cartridge Co's ammo manufacturing machinery left Lowell Massachusetts and was moved to New Haven, Connecticut at the Winchester plant. 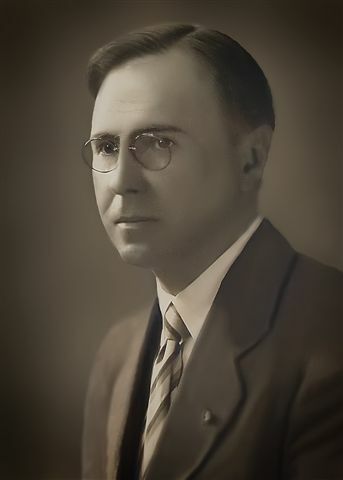 By 1926, Winchester had to honor the U.S. Cartridge Co. brand for another 10 years. 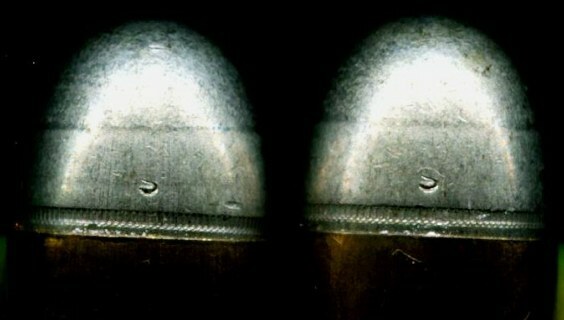 Two "S" stamped version .45 caliber bullets made by the U.S. Co. One at the left with cannelures and the one at the right smooth. The interesting ballistic find was that these rare limited run (July, 1927- July, 1928). 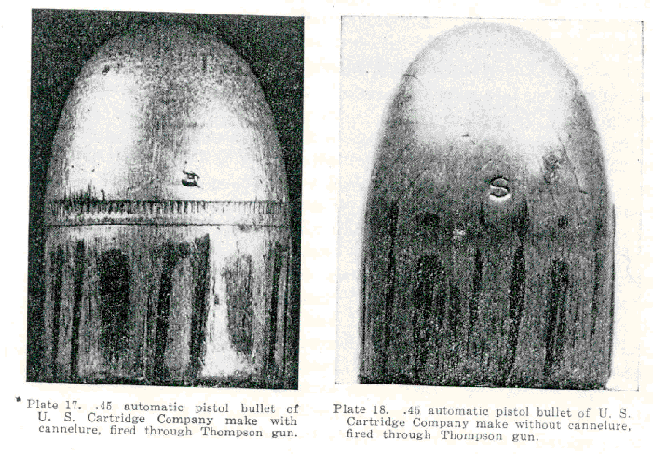 These particular "S" bullets were found in the bodies of the massacre victims and also in Fred Burke's possession when the massacre guns were seized in St. Joseph, Michigan. 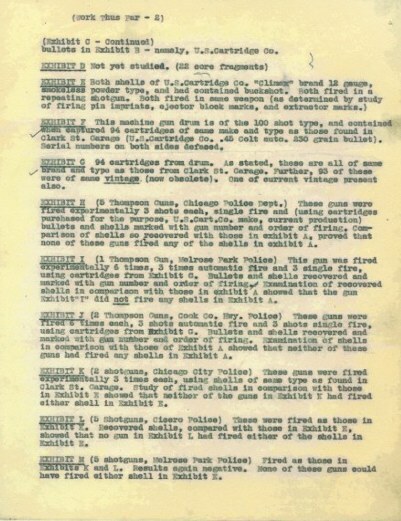 (Excerpt of ballistics expert Calvin Goddard Courtesy of Bill Helmer, info special thanks to Ken at Vintageammo.com Bill Helmer, Richard Garcia, Chuck Schauer, Curtis Steinhauer and David Call). 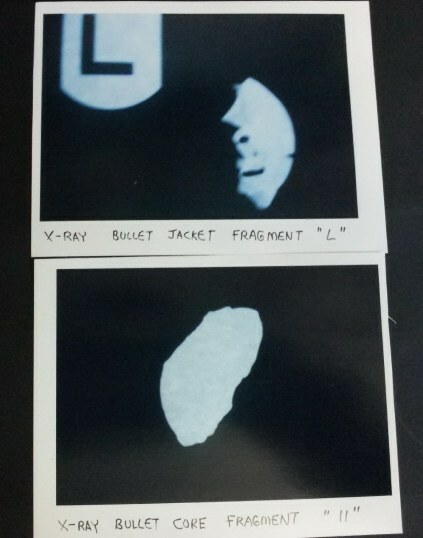 Right: Goddard has scratched the letter "L"
Fiber protruding from bullet jacket. 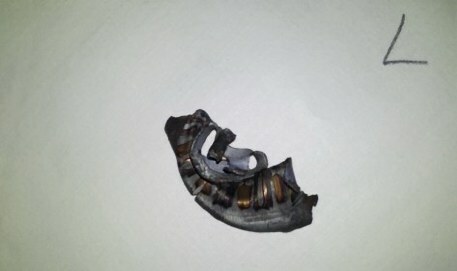 A piece detached which seems to be material attached to bullet jacket. 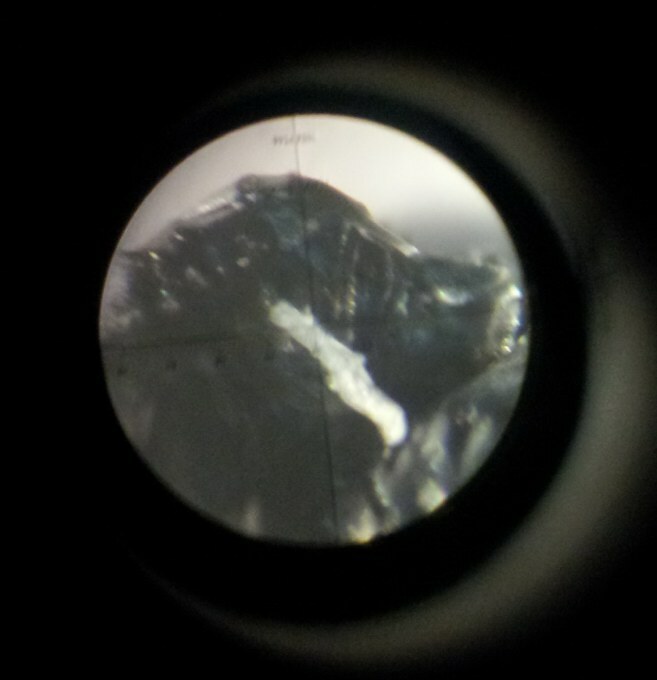 Under 100X microscope it looks like fibers. 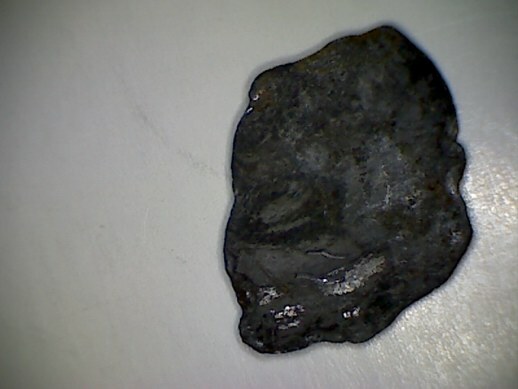 Number "11" scratched on bullet core. 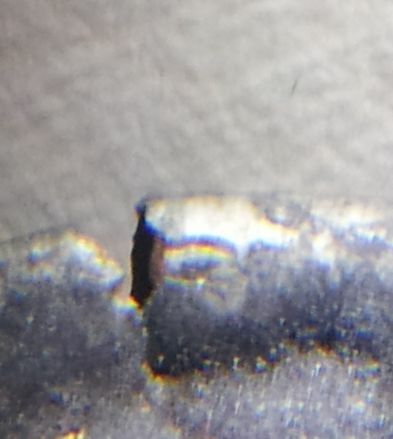 Close up of bullet core 11 shows it hit the brick head on, but going through a body first. Notice specks of brick from massacre wall at 2122 North Clark at top right that is impregnated in lead. 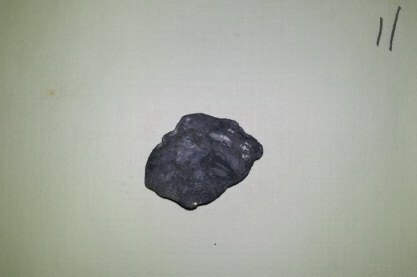 Bottom left reveals dried blood. 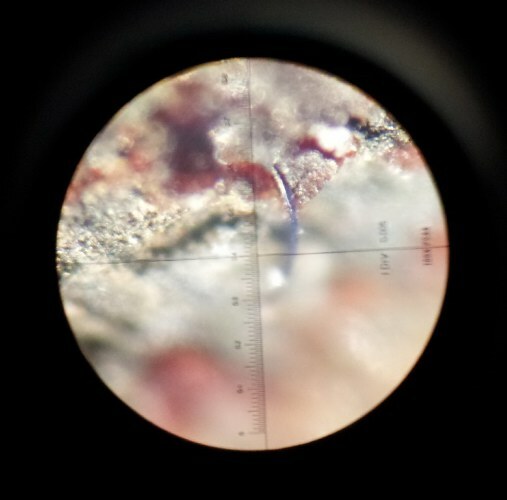 Close up of bullet core 11 magnified 100X reveals dark brown red specks and a blueish fiber. The red specks look like dried blood. Fiber is possibly hair, hat,coat, shirt or scarf material. 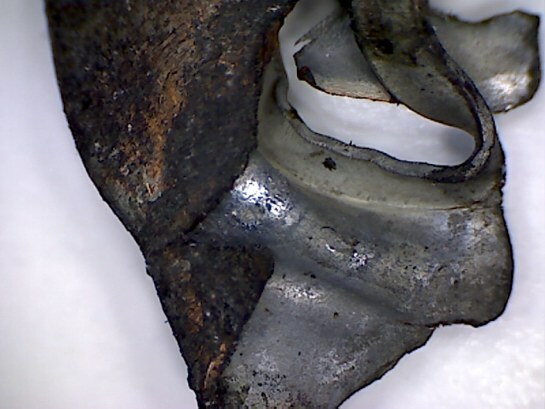 This bullet core fragment shows that it hit a brick in the wall with brick marks on the front of impact. It may have very well passed through a body before impacting in the wall. Back side of bullet core fragment that hit the wall. 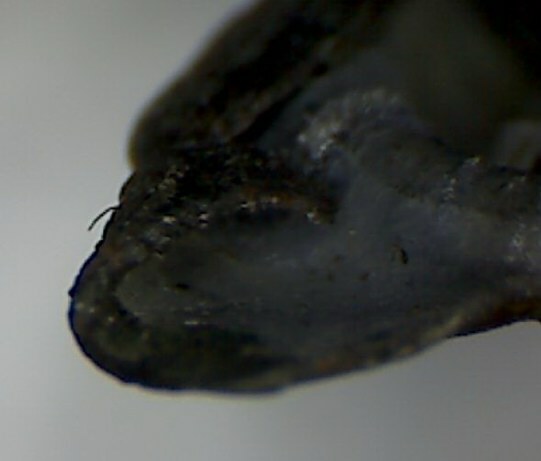 Note these two fragments are not from the same bullet, but from two seperate ones. 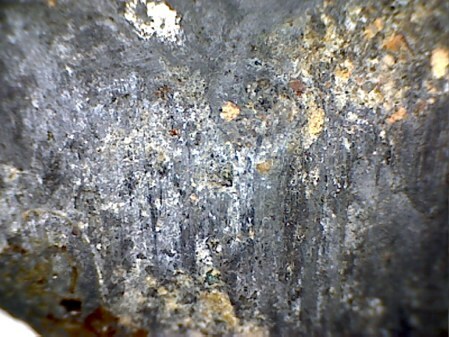 Close up of backside of bullet core. My special thanks to Mr. Neal Trickel for this kind donation. Page created on July 12, 2012.